Many gamers surely agree video games are not the evil they have been made up to be. Video games help in child’s brain development; improve kids’ ability to think, create and apply multiple strategies; develop critical analyzing techniques, etc. It depends on what type of games kids are playing. Researchers found out, for instance, kids that always play games that contain violence will have a tendency to behave aggressively whereas those who are exposed to educational video games can improve their reading and spelling abilities. Hence, it is always a parent’s duty and responsibility to guide and control the games their kids should play. Of course parents can also limit the sort of games to be installed in the computer and limit their kids’ playing time. However, this might not work if the parent themselves are game enthusiasts and have many adult games installed. Worse still is they are sharing the computer with their children. To continue enjoying you favorite games without compromising the need to protect your children from unlimited access to the computer, Game Protector could be your solution. 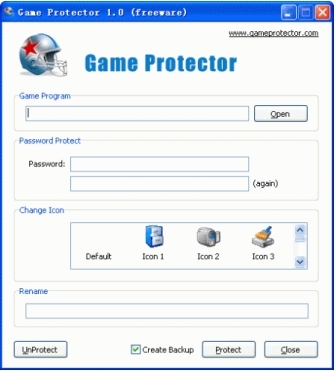 Game Protector is a freeware which is able to protect your computer games with a password and restrict others without password from accessing them. This protection tool is straightforward, easy to use and features an user-friendly interface. Users who want to apply this parental control measure can download the application via the direct link here. Users will be prompted with a simple interface once they have executed the file. Users need to browse to the folder where the executable game file is in and add it. Entering a password will thence protect the game to be executed without an authorized password. Users also can use this application to change the icon of the executable and to rename it. Besides preventing kids from playing some unauthorized games, users also can make use of Game protector to protect other sensitive applications from an unauthorized usage. The other advantage of this tool is it doesn’t have to be running in the background to protect the executable.